The way you choose to dress your windows can have a huge impact on more than just the style of a room. Certain types of blinds can increase sustainability around the home, keep rooms cool in summer and warmer in winter, providing you savings on your yearly energy bill. How? The answer is through improved insulation. Glass windows are notoriously poor at retaining or regulating air temperatures. As a result, if you fail to dress them properly, money is basically leaking out of your windows. The right choice can make your home more environmentally friendly and save on energy bills in the long term. Cellular blinds – a new design that seamlessly blends style with function – are a particularly effective option thanks to their innovative honeycomb cell structure. Let’s take a look at how cellular blinds can help solve your insulation issues. Glass windows serve as a two-way transfer point when it comes to temperatures entering or exiting a room. This means that heat leaks outside while cold simultaneously seeps in. Windows can account for as much as 25% of total heat loss in the average home. According to information released by the Australian Energy Regulator, the average electricity bill for a household in Australia is estimated at $1,690.00. If you’re not insulating windows correctly, a significant amount of that energy expenditure is more or less vanishing into thin air. Heat loss from windows: Warm air moves toward cold glass, heat is lost through unprotected glass. Heat retention: Warm air is retained in the room due to well insulated window. 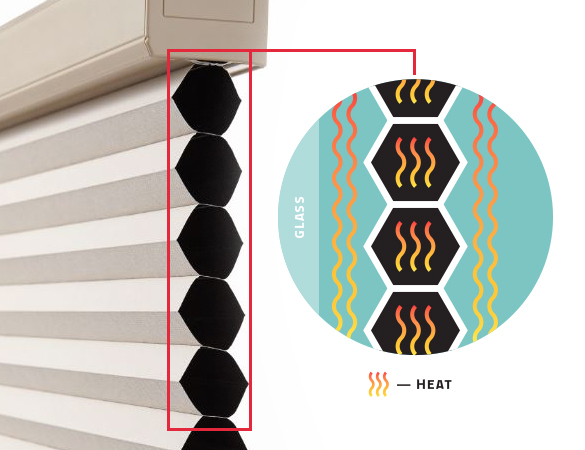 While all blinds offer some form of insulation for improved heat retention, some styles are more effective than others. Thanks to their innovative pleated cell design, Cellular Blinds (also known as Honeycomb Blinds) create a series of pockets: the air pockets within the cell-shaped structures of the blind itself, and the standard gap that provides a buffer between the fabric and the window. This double air pocket creates more barriers for the temperate air to travel through. As a result, Cellular Blinds are an incredibly effective method of retaining and regulating temperatures within the home. The insulating double barrier provides excellent temperature retention, but the distinctive honeycomb blind style also offers a range of other benefits that make Cellular Blinds a fantastic choice. The pleated air pocket provides highly effective sound block out, decreasing noise impact from nearby traffic or loud neighbours. Additionally, because there are no slats or gaps in the pleated-honeycomb design, cellular blinds can also create a total blockout for complete privacy in bedrooms or kids rooms. The design is also cord free, making for a safer option for homes with children or pets. Our Cellular Blinds are available in off-the-shelf sizes for a range of common window dimensions. Alternatively, the Cellular range can be cost-effectively cut-to-size for non-standard windows. For more information on the range, our Cut-To-Size service, or how Cellular Blinds can provide a huge range of benefits through better insulation for your home, take a look at the Cellular range now or get in touch with a specific enquiry. If you can't find the size you require in our standard range we also offer a Cut-To-Size service.